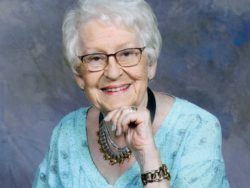 Barbara Stewart-Schieck - Heritage Funeral Homes Inc.
of Elora passed away peacefully at Groves Memorial Hospital, Fergus on Friday, March 15, 2019 in her 87th year. Beloved wife of the late Arnold Stewart (1983), Douglas Schieck (2010) and Douglas Grove (2015). Dear mother of Major Kent Stewart and his wife Leslie of Kingston and Carol Bailey of Kitchener. Loving grandmother of Dylan Stewart and Kelsey Bailey. Loved step-mother of Elaine Hensen of Buckhorn and the late John Hensen, Yvonne (Rev. Tom) Carman of Windsor, Jeanette Schieck (Bruce McKay) of Orr Lake, Jim (Annette) Schieck of Vegerville Alberta, Don Schieck (Kaye Wood) of Arkona, Elizabeth “Betty” Schieck of Guelph, Catherine Schieck (Pat Rooyakkers) of Grand Valley, Marilyn (Murray) Abraham of Fergus and Bob (Peg) Schieck of Moorefield. Fondly remembered by her three sisters Marie Stoddart of Elora, Lillian and her husband Bill Ingram of Ariss and Marion Ferguson of Milton, sisters-in law of Delores Trask, Dorothy Potter, and Margaret Stewart and brother in law Larry Schieck, as well as her many step-grandchildren and step- great-grandchildren. Predeceased by her parents Rev. Reginald and Irene (Bowman) Trask, brothers and sisters-in-law Donald (Lorna) Trask, Robert (Shirley) Trask, Leslie Trask and Douglas (Donna) Trask, sisters-in-law and brothers-in-law Bertha (George) Douglas, Garnet Potter, Christina Schieck, Floyd Stewart, Morgan (Marjorie) Schieck and Arthur (Phyllis) Schieck. To honour Barb’s wishes Cremation has taken place. The family will receive friends at the Graham A. Giddy Funeral Home, 280 St. David Street, South, Fergus on Monday, March 25, 2019 from 2:00 to 4:00 and 6:00 to 8:00 p.m.
Additional visitation at Melville United Church from 1:00 p.m. until time of Service at 2:00 p.m.
Rev. Marion Loree will conduct a Memorial Service of Remembrance in the Melville United Church, Fergus, on Tuesday, March 26, 2019 at 2:00 p.m. followed by a reception in the Fellowship Hall of Melville United Church. Brighton Chapter 201 will conduct an Eastern Star Service in the Funeral Home on Monday evening at 8:00 p.m.
Spring Interment in Elora Cemetery. As expressions of sympathy donations to Sleeping Children around the World would be appreciated by the family.